Re-color tool for app developer's. Is there a better alternative to IconRecolor? Is IconRecolor really the best app in Developer Tools category? Will IconRecolor work good on macOS 10.13.4? IconRecolor is a tool for app developers and graphic designers that allows them to re-color icons. 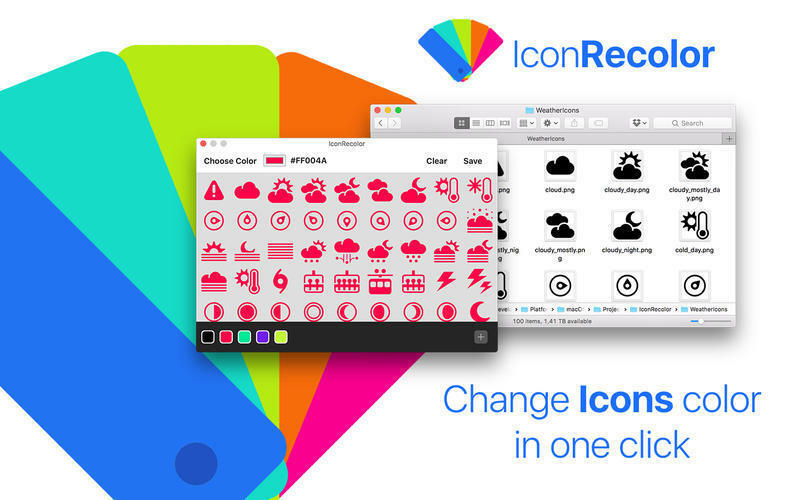 With IconRecolor you can re-color icons with a single click. Choose the color, add the HEX value, drag the icons and click save! You can save your favorite colors to use them later. IconRecolor is a really helpful App for all the Developers and Graphic Designers. Send me any feedback or improvement request. We redesigned a brand new Icon and User Interface. We added a new feature: Color Favorites! Now you can manage your color favorites the the useful bottom bar. IconRecolor needs a review. Be the first to review this app and get the discussion started! IconRecolor needs a rating. Be the first to rate this app and get the discussion started!